LaCie announced its latest peripherals featuring Thunderbolt™ technology today at the 2012 International CES®. The new 2big Thunderbolt Series delivers speed, flexibility and capacity, while the eSATA Hub Thunderbolt Series allows users to connect external eSATA drives to their new Macs®. This announcement follows the unprecedented success of LaCie's Little Big Disk Thunderbolt Series and further asserts the company's commitment to deliver high-quality products featuring Thunderbolt technology. "LaCie is proud to offer the widest range of storage solutions featuring Thunderbolt technology," said Erwan Girard, Professional Business Unit Manager, LaCie. "These products are some of the fastest and most flexible storage solutions on the market. They will dramatically accelerate the workflow of even the most demanding digital users." With speeds up to three times faster than FireWire 800, the LaCie 2big also features RAID security, hot-swappable disks, daisy chain convenience and a solid-aluminum casing. Heavy data users will appreciate capacities up to 8TB with jaw-dropping transfer rates up to 311MB/s. Daisy chaining multiple 2bigs even increases overall performance. With the 2big, backups take a fraction of the time, letting the user back up more frequently. Videographers working in Final Cut Pro X® or other professional software can even stream multiple HD video streams directly from the drive. Photographers using Lightroom® or Aperture® will notice significantly more responsive photo library browsing. 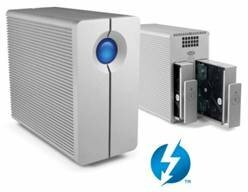 The eSATA Hub Thunderbolt Series gives new life to existing eSATA drives with Thunderbolt innovation and backward compatibility. It connects to a late-model Mac via the Thunderbolt port and features two eSATA ports. This lets the user connect two eSATA external hard drives to the Hub and get full eSATA speeds on their new Mac. The Hub also features a second Thunderbolt port that lets the user connect other Thunderbolt peripherals. This means up to 12 eSATA drives (6x Dock, 2x eSATA links per Hub) can be connected via a single connection to a Mac with full eSATA 3Gb/s speeds. The 2big Thunderbolt Series and eSATA Hub Thunderbolt Series will be available in the first quarter of 2012. Thunderbolt cables can be purchased separately on Apple.com. For full specifications and product information, visit www.lacie.com.